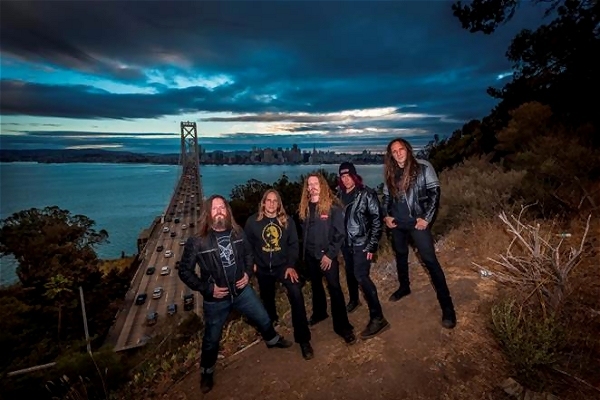 In the fifth & final exclusive trailer on GUITAR WORLD.com that showcases material from the bonus “Making Of” DVD entitled “Blood Upon The Goat,” EXODUS drummer Tom Hunting gives fans a tour of his “Goats-R-Us Ranch & Studios” where the band’s tenth studio album Blood In, Blood Out album was recorded. *Chicago-area EXODUS fans! * Enjoy tasty new licks and the tasty new “EXODUS Burger” at Kumas Corner in Chicago, IL this Saturday, October 11th during the official Chicago-area EXODUS listening party! Enjoy the new limited-edition burger in celebration of the band’s 10th studio album and listen to the entire record from 7:00-10:00pm. The event will also include awesome EXODUS merch giveaways. For more info, visit www.kumascorner.com. Blood In, Blood Out is due out in North America on October 14th; the digi-pak version will include a bonus DVD. In the second of five exclusive trailers on GUITAR WORLD.com that showcases material from the bonus “Making Of” DVD entitled “Blood Upon The Goat,” Altus reveals that he wrote the tracks “Honor Killings” and “Body Harvest” appearing on the band’s tenth studio album, Blood In, Blood Out, due out in North America onOctober 14, 2014. The bonus DVD is included in the album’s digi-pak and import box set versions. This is how guitarist & songwriter Gary Holt of Bay Area thrashers EXODUS describes his work on the band’s tenth studio album, Blood In, Blood Out in the first of five trailers showcasing material from the bonus “Making Of” DVD entitled “Blood Upon The Goat,” which will be included in the album’s digi-pak and import box set versions. Produced by Andy Sneap (ACCEPT, KREATOR, MEGADETH), Blood In, Blood Out can be pre-ordered from the Nuclear Blast USA Webshop in CD, digi-pak + bonus DVD, 2-LP exclusive yellow vinyl, and imported limited edition box set formats. Bundles include a t-shirt with exclusive artwork by Swedish artist Par Olofsson (PSYCROPTIC, ABYSMAL DAWN, REVOCATION) + a poster (while supplies last).